For you people getting snow dumped on you by the metric ton-load this winter: make lemonade out of lemons. 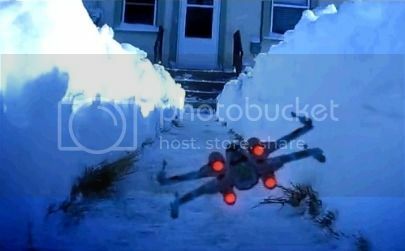 Or, more specifically, make a Death Star trench run out of your shoveled front sidewalk. Or make Sno-cones out of road salt. Whatever. Just keep your damn dog off my lawn. Via Reddit, who’s going to use his targeting computer, because the Force is just a bunch of little microorganisms, anyway, and since when can microorganisms aim proton torpedoes?